Our job seekers know themselves, but do they know you? A survey of our audience shows that the vast majority define themselves as being ‘geographers’ or in a field they consider very close to geography. However, they may not know that your organization values their particular education & experience and have job vacancies meant almost exclusively for them. By posting your jobs on GeographyJobs.ca, your company logo is placed into rotation on our homepage as a featured employer - FREE. 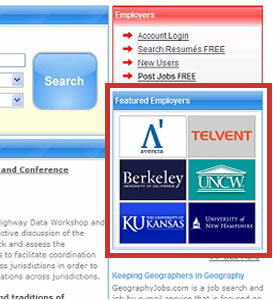 From here job seekers can click your logo to see your active job postings or your company profile. This is a great way to extend your organization's brand to our unique audience of job seekers and to provide increased exposure for your vacancies at no added cost. It’s another way we give better value for your vacancy marketing investment. What areas of work interest our audience? Show that your organization values their education and experience.